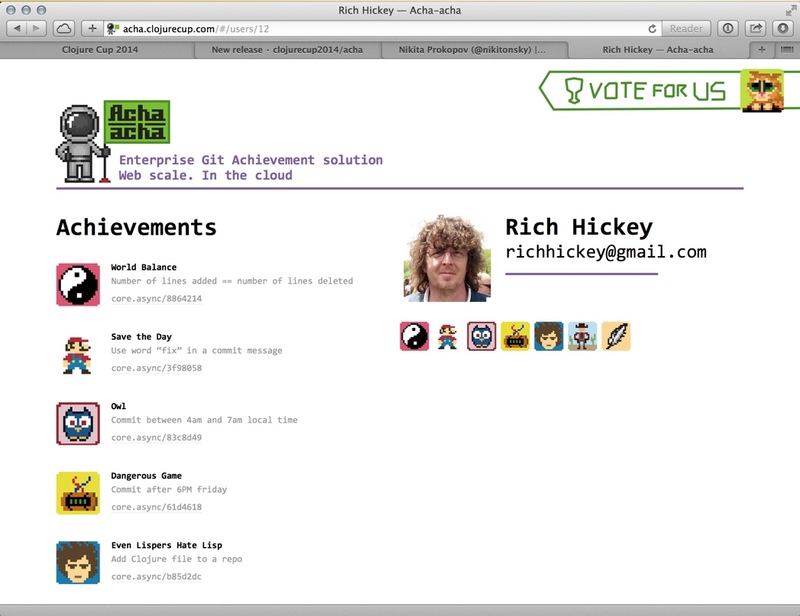 Last weekend my friends and I built Acha-Acha — a Git Achievements web app for ClojureCup hackathon. It’s the most clojure-y application I’ve ever written: we used Clojure, core.async, transducers, http-kit, Transit, ClojureScript, sablono, and DataScript — of course. (plus React and JGit from non-clojure stack). My part was UI development, and DataScript helped a lot. Acha-Acha follows the idea of a dumb but persistent server and smart ephemeral client: all data is loaded via single fetch on a page load and everything else is handled by a client. It’s literally everything, including page navigations, data sorting, filtering, aggregating: server just sends every fact it’s aware of, and client deduces lists, totals and sums from raw data on the fly. 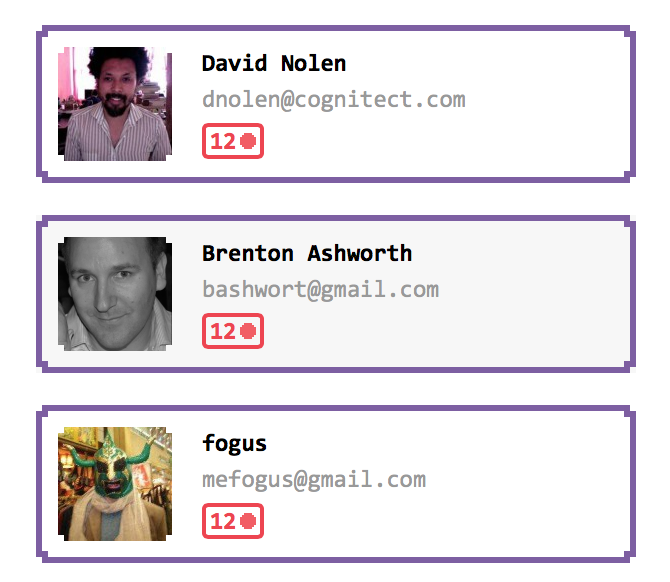 For example, on index page there’s achievement count on each user’s badge: it’s not stored in a database, but calculated on a client from a raw achievements list (equivalent of select count group by). Once app is loaded, you can go to any page and there’ll be not a single ajax call for that. Each page is just a couple of queries to already fetched DB. Doing zero ajax calls is wickedly fast, much faster than talking to server, even very good one. There’s no “RESTful” server API, of course — just one endpoint (/api/db/) that dumps everything. We can probably generate response once and serve it from disk via Nginx, it’s not dynamic at all. This little snippet is everything you need to magically transform a fully static web app to a fully dynamic one. On any page, wherever you are, you’ll see up-to-date information and all the changes in real-time. If a user gets awarded, you’ll see the new achievement popping up on user’s page, on index page you’ll see how his medal’s counter gets advanced, and on repo’s page you’ll see his avatar being added to the achievements list. Amazing thing is that there’s no code to support any of this. There’s just one listener that puts everything it sees to the database. It wouldn’t be possible without React, of course. Where DataScript gives you simplicity with “just put everything to the DB”, React gives you simplicity with “just take the DB and render everything from it”. In Acha-Acha, every page is always rendered from scratch, including data queries for everything it needs; we don’t even have Om/Quiescent style optimisations of shouldComponentUpdate — and still, it’s quite performant and perfectly useful. Overall experience from using DataScript was very smooth and it performed with dignity in tough conditions of limited time and unexpected performance demands (e.g. each page re-rendering is a couple of queries and a lot of entities lookups over a database that contains every fact about everything). It leads to an architecture that is quick to develop and requires very little effort to achieve outstanding results. You can check out live version at acha-acha.co. Everything is still not smooth enough† — beware. Please do not abuse it, as we’re still not prepared for real-world SaaS. We also have the source code available at github. It was updated with most urgent patches, including real-time page updates, missing images, better repo handling, progress-bar, etc. And we have portable version. It’s totally autonomous, only prerequisite is Java. It’s for private network setups, when you want to play with achievements but don’t want to share your secret code with us. Feel free to. Instructions. As for the achievements themselves, we’ve implemented just about ⅓ of what we’ve planned. Much more to come.